Join us tomorrow – Saturday, December 1st for crafts, carols, sleigh rides, and more holiday fun as we light up our 50 foot spruce tree at Concordia University of Edmonton! 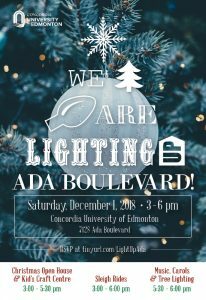 For the 7th year in a row, CUE will be lighting up Ada Boulevard to spread Christmas cheer and welcome the Advent season. Everyone from the Concordia family and community is invited to attend this FREE family-friendly event.